Bake like a pro and collect an expert tool kit with Bake Box, the new subscription box for bakers. 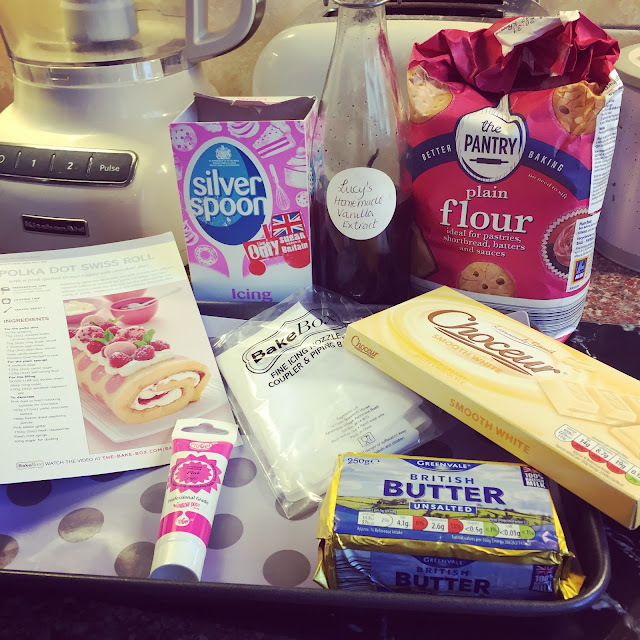 This month I was lucky enough to be sent the first ever Bake Box from the Bake Box subscription service. I was really excited to see what it was all about, and to be able to report back to you my lovely readers, giving you the low down on it. 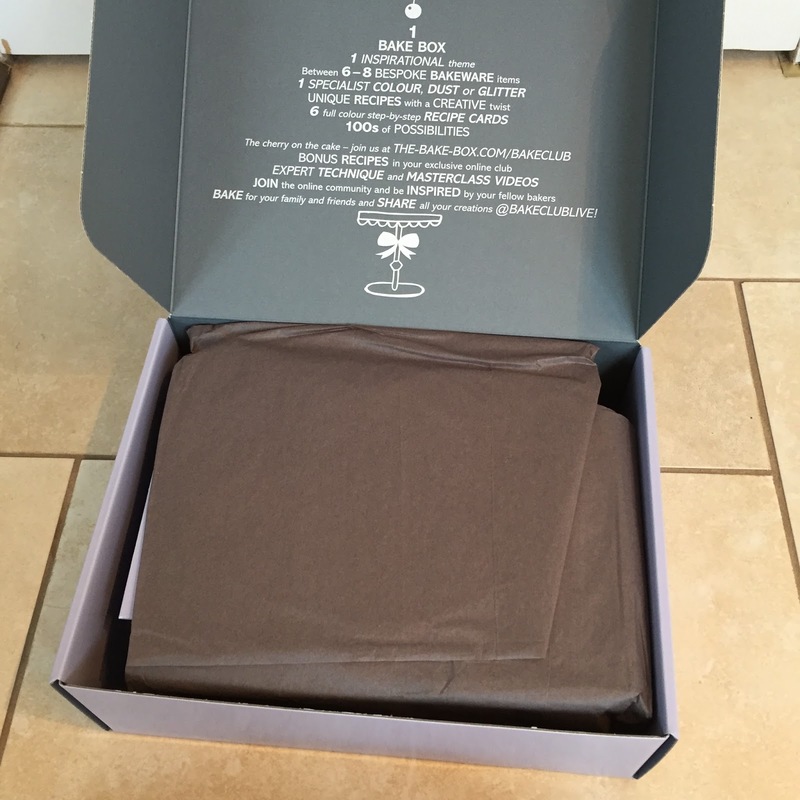 -At least 6 specially curated bakeware items - Each box contains a specialist piece of equipment that you'll need to create each of the 6 amazing new recipes - all based around a specific theme. Two of the pieces will be innovative bakeware pieces so you can stand out from the crowd. 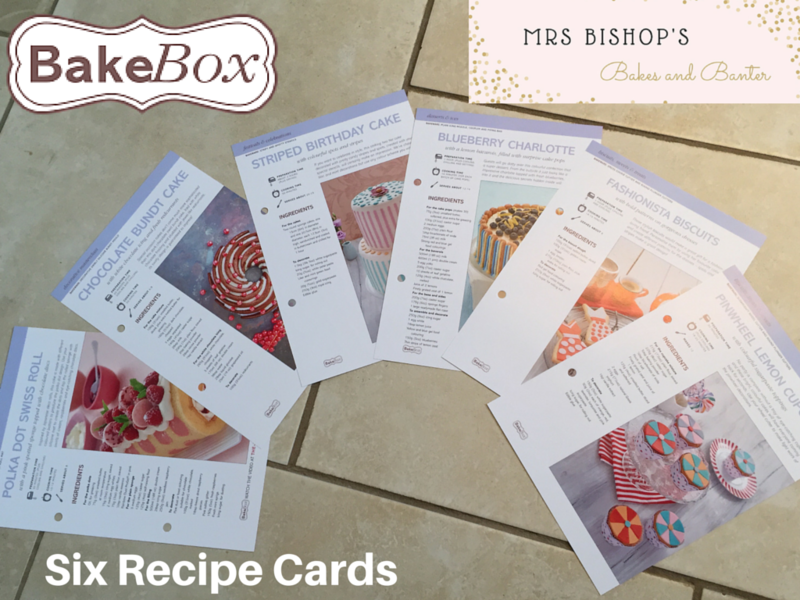 -Six full colour recipe cards - Each box contains 6 fully illustrated cards. The cards create a clear guide to baking the perfect cakes and desserts, and decorating them in a truly unique way. 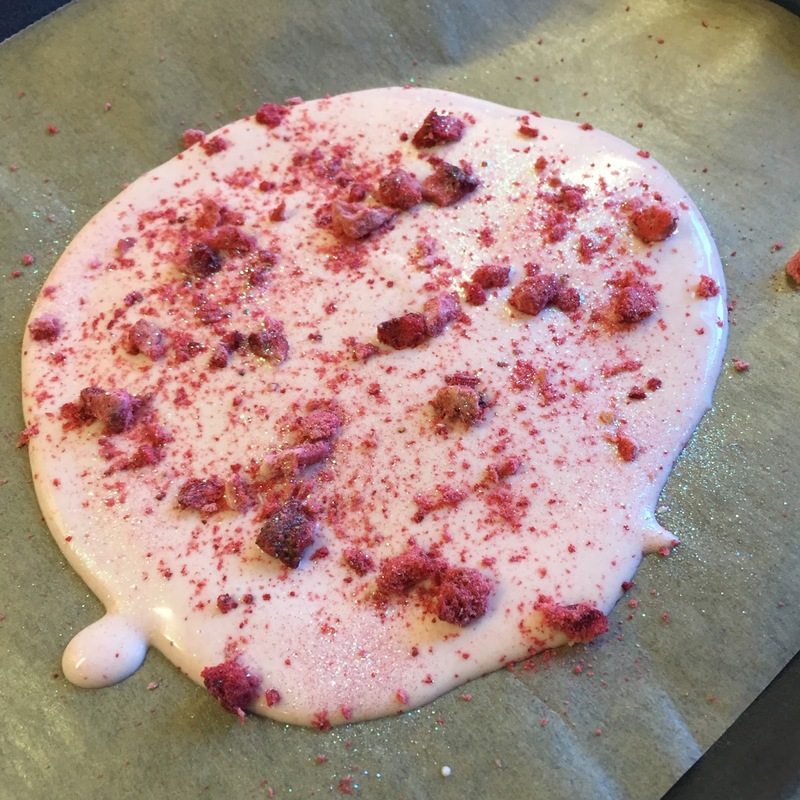 The recipes will include two 'hero recipes', one show-stopping cake recipe, one dessert recipe and two simpler recipes that are great to make with children. 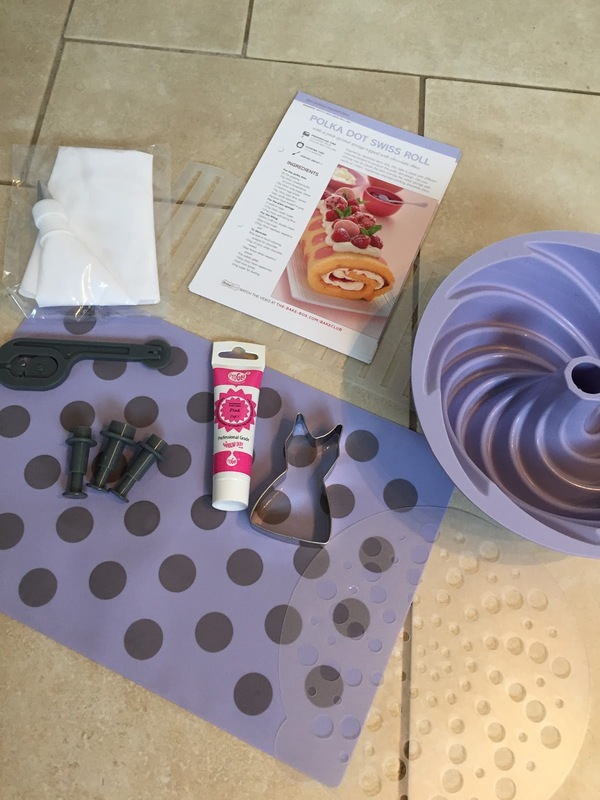 -Decorating kits from Rainbow Dust - Bake Box have teamed up with Rainbow Dust to offer subscribers fantastic professional-grade cake decorating products that will add the ultimate finishing touch to your bakes. -Complimentary access to 'Bake Club' - With a subscription to the Bake Box you automatically receive complimentary access to the 'Bake Club' site. Here you can check out masterclass videos, enjoy fortnightly bonus recipes, expand your knowledge of ingredients and techniques and show off to your fellow bakers! Bake Box won't break the bank either. At £14.99 per box, it's great value for money as each box contains at least £40 worth of equipment. Spots & Stripes! Could there be a more perfect theme for me - a stripe and polka dot obsessive! Ha! I was genuinely chuffed to pieces with my first box. 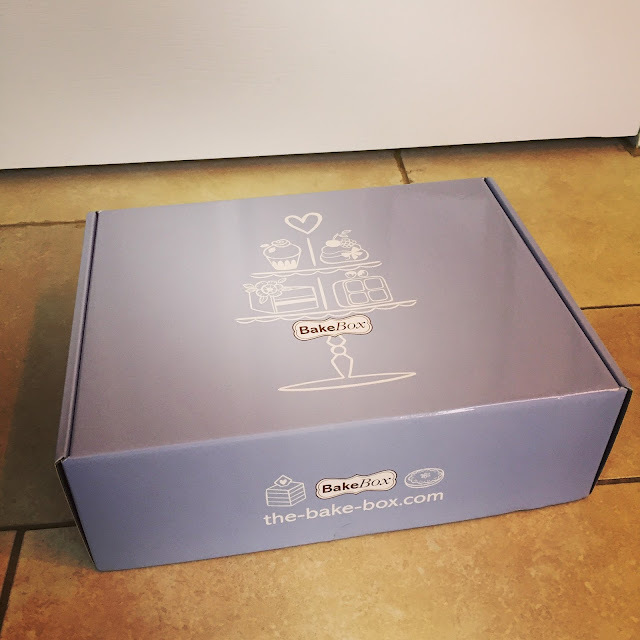 Not only is Bake Box beautifully presented, it genuinely contains recipes I want to bake, and equipment I'm excited to use. Each item in this months box is something I could genuinely see myself using in the future. 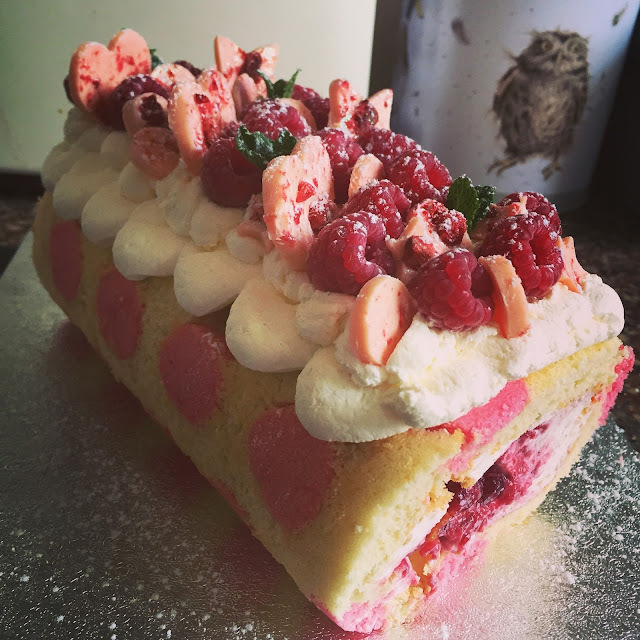 In order to truly put this box through its paces I knew I needed to test a recipe and decided to go for the 'Star Recipe' in this box, which was the Polka Dot Swiss Roll. I choose this one because I've never made a Swiss roll before, nor have I coloured sponge or attempted to bake a pattern into a sponge, so I knew it would be a fun new challenge for me. I also wanted to bake something I could share with my family for my Father-in-Law's birthday celebrations, so I wanted something that would feed eight. 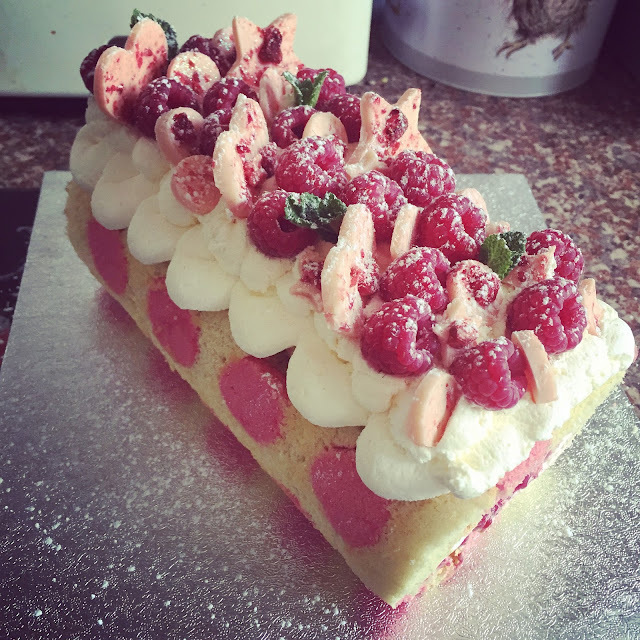 The other bonus of this recipe is that it used mainly store-cupboard ingredients - and I only needed to buy fresh cream, fresh raspberries, white chocolate and freeze dried raspberries to complete the bake, so it didn't break the bank either - bonus! Getting all my ingredients and equipment together, ready to bake! The way the polka dots are constructed is so clever - you create a meringue/sponge hybrid which you colour pink and then pipe that directly onto your silicone spotty mat that came in the box, you then set the polka dots in the fridge for a few minutes while you whip up the plain Swiss roll sponge, and gently spread the plain sponge over the pink spots before baking for 10-12 minutes. They came out as perfect pink spots and I might have even let out a little squeal when I saw them. 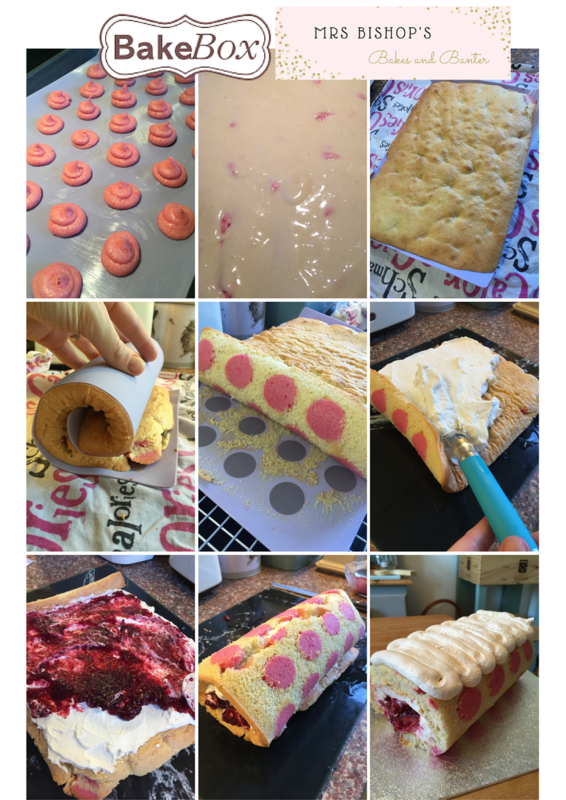 It's important to roll your Swiss roll sponge while it's still warm from the oven with the silicone mat still inside it, so as to avoid the sponge breaking completely when you come to fill and roll it later when fully cool. 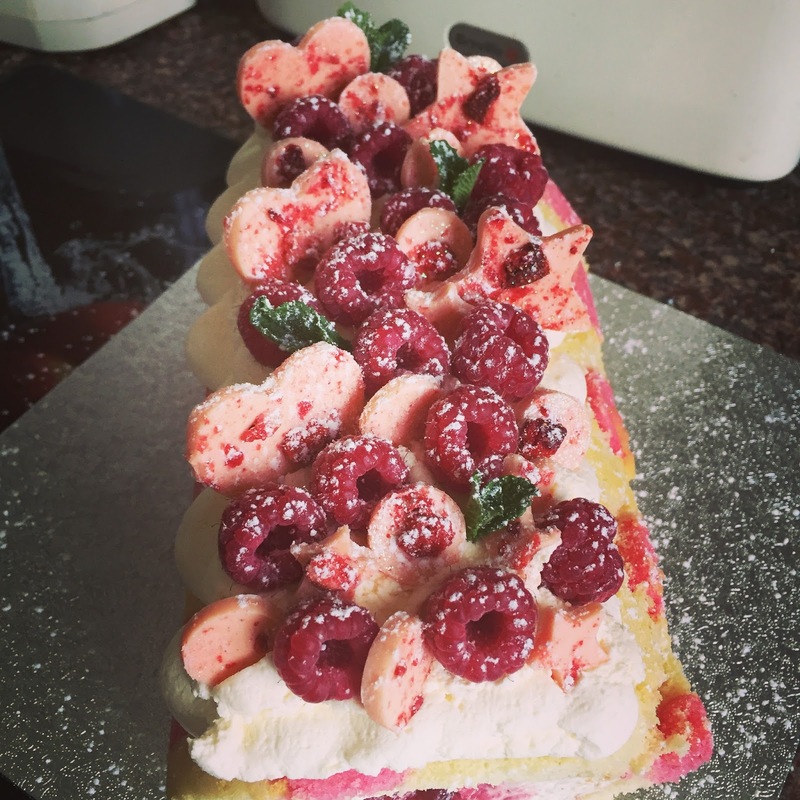 It seems pretty much impossible to avoid small cracks, but the beauty of this recipe is that it is so heavily decorated across the top, that you can cover any small cracks and your tasters will be none the wiser! Genius! The really fun creative bit in this recipe was the decoration. As well as filling the cake with lightly whipped vanilla flavoured fresh cream (I used my uber scrummy homemade vanilla extract) and raspberry jam, the Swiss roll is then topped with piped on cream, fresh raspberries, fresh mint sprigs, white chocolate decorations and a dusting of icing sugar. 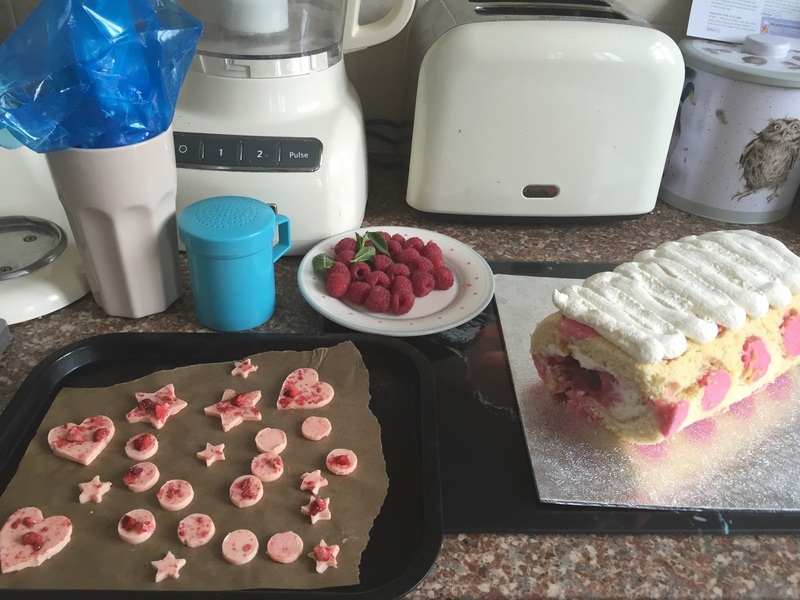 I particularly enjoyed the process of making the white chocolate decorations, and for me it was totally worth the extra effort for how the cake looked and tasted once finished. The recipe calls for you to melt and then colour some white chocolate, then spread it over a tray lined with non stick parchment and sprinkle on edible glitter and freeze dried raspberries. You then leave the chocolate to firm up (but not set totally) before using little shape cutters to cut out cute decorations which you can then leave to set hard in the fridge before adding to the cake. Mmmm melted white chocolate coloured light pink using the Rainbow Dust pink gel that was included in this months box. My final shapes - ready to be placed in the fridge to set hard before adorning my finished Swiss roll. I was so truly proud of the final cake, and was so excited to show it off to our family on Sunday for a birthday lunch for my lovely Father-in-Law. 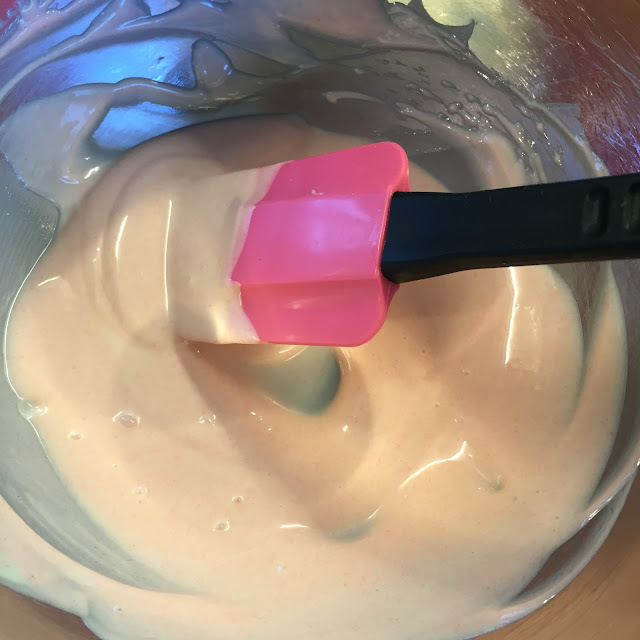 What I loved especially is that it pushed my baking boundaries in a non-threatening way - Bake Box was there to hold my hand all the way through it, and undoubtedly made the whole process far easier that it could have been had I not had reliable equipment, instructions and recipe. T'ah D'ah! Now doesn't that look good enough to eat! My finished decoration - so pretty! My first ever polka dot Swiss roll in all it's glory! Now, as good as it looked, the most vital part for me when it comes to recipe testing is: does it taste good? And I can totally vouch for this recipe on the taste front, as it was totally delicious: a soft sponge with a hint of vanilla, billowing fresh cream spiked with homemade vanilla extract, the rich fruitiness of the raspberry jam with the super-sweet white chocolate and the tart fresh raspberries and vague hint of fresh mint to cut through all that richness. It tasted like a glorious summer day. 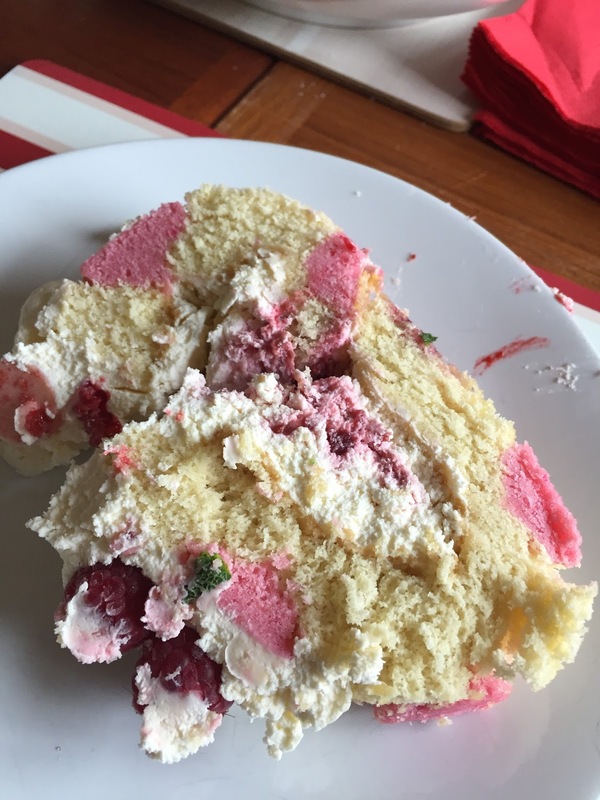 In fact, crumble on some meringue pieces and you'd have yourself an Eton mess of sorts. The family polished off the whole cake in one sitting, and we even adorned it with some birthday candles so we could sing the obligatory song, mainly for Bert's enjoyment! The money shot - just in case I didn't have you sold already - who wouldn't want to dive headfirst into a slice of this? In conclusion then my first Bake Box has been a huge hit: yes, it's gimmicky, but it also contains bakeware I'll actually use, recipes that excite me and are reliable - the whole thing is well packaged, beautiful and incredibly well thought out. 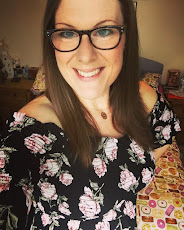 Plus, I think it's really great value for money...it excites me hugely to think about the amazing collection of recipes and bakeware you'll have amassed by the end of your first year! 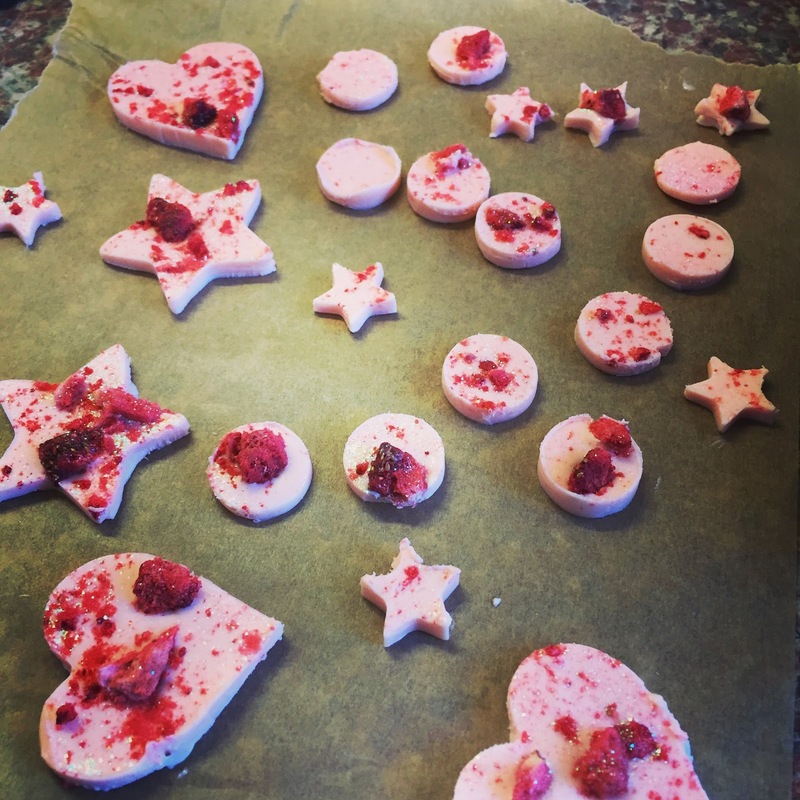 It would make the most brilliant 'being kind to yourself' treat, a fab gift for any aspiring baker, or would even be a fun bi-monthly family challenge: pick one of the family-friendly recipes and create them together. 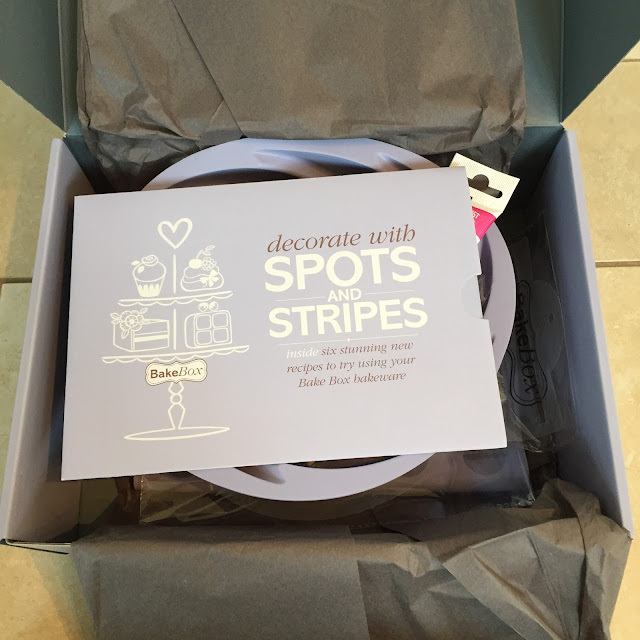 Disclaimer: I was sent this Bake Box in exchange for a true and honest review of the Bake Box subscription service. 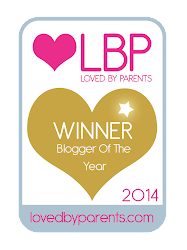 Ahh thanks poppet! It really is the perfect subscription for me - so pretty & useful! 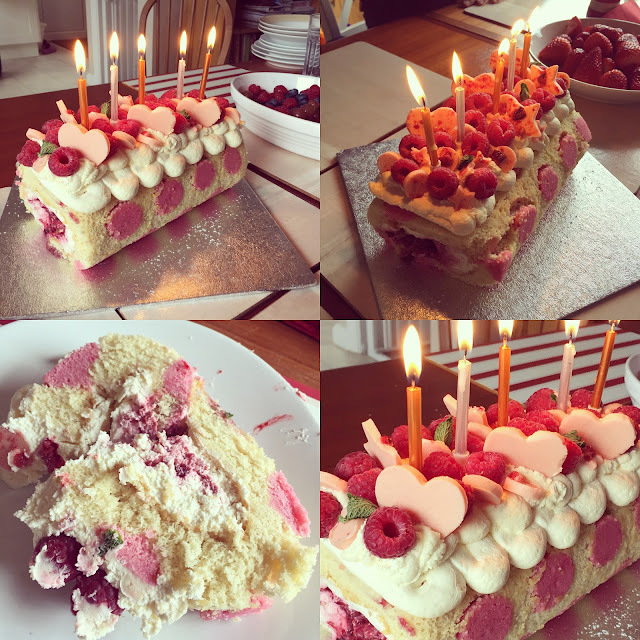 I was so chuffed with the polka dot swiss roll - I do love to challenge myself when it comes to baking!